After the high winds and rain forcing cancellation of race 2 it was a delight to have a decent breeze and a bit of sunshine to cheer the small fleet gathered at Gilkicker for race 3 of the Spring series. 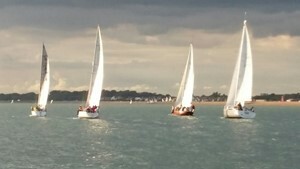 Option, the SOOD set a course in the northerly breeze of a spinnaker reach to SE Ryde Middle and a true beat back to Stokes Bay Central with a close reach to the finish. Following initial confusion with the number of starts to be used the fleet of 7 yachts split into 2 via some strange telepathic arrangement and the slower boats were first away at 1830. The latest addition to the race series, Moonfleet, the Sun Odessy 35 of Tania Grant was clearly eager to get into the fray but a tad enthusiastically resulting in an OCS call from the SOOD. She responded, recrossed and set off in pursuit of a rapidly disappearing Spirit of Kudu and Wizard. The second start was a tight affair with Tinker T, Sunshine and Option in a tight knit bunch with Jolly Jack Tar close behind. All went for kites at Darling Associates as they set off in pursuit of the slower yacht fleet. Kudu, the slow fleet leader held her nerve and pace to round SE Ryde Middle ahead of Sunshine and the bunched faster yachts and started the beat back to Stokes Bay. Which side would pay? The fleet split and at Stokes Bay it seemed that the left side was marginally quicker. The reach to the finish was white sailed by all except JJT who gave herself a little windward gauge and hoisted a code zero which certainly did the trick as she steamed back at the fleet. just overhauling Tinker T on the finish line. When the numbers were crunched Tinker T held on to win IRC and Option NHC.